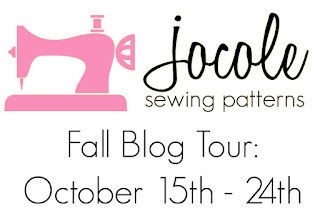 Jocole October Blog Tour and GIVEAWAY!!! 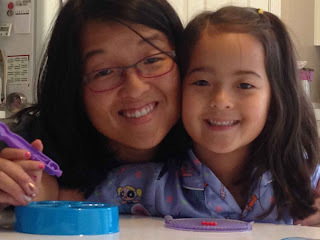 Wordless Wednesday- Beado with Mommy! 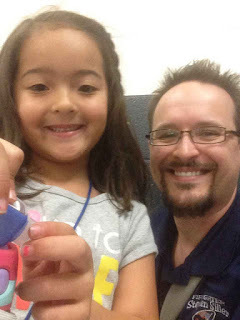 Wordless Wednesday- Lunch with Daddy! Lil' Miss dressed up as Barbie Super Sparkle for Halloween, this year! 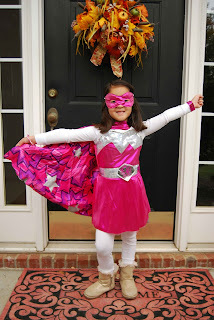 Basically, she was a female superhero in a sparkly pink costume (what's not to love?!). Ha! 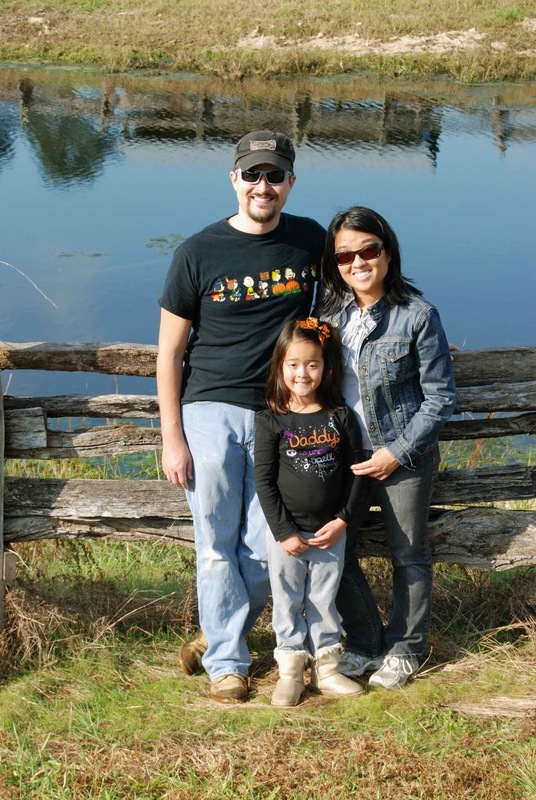 Just like last year, Katy's best buddy, Connor and his family came over to trick-or-treat. First, we ate a rushed dinner (those kids wanted CANDY!) and then roamed the neighborhood. Katy and Connor had a blast running up ahead trick-or-treating. They came back with a haul of candy and stayed up way past their bedtimes! (Note, Halloween night happened to fall on Daylight Savings, this year. Lil' Miss didn't get the memo- she woke up extra early the next morning...... so much for an extra hour of sleep!). Katy found her perfect pumpkin! This past weekend, we had the opportunity to visit our family favorite place to pick pumpkin- Riverbend Farms! 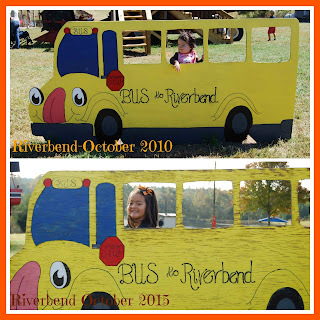 We've been going to Riverbend Farms since Katy's very first Halloween and she still loves it! We met up with some friends and the kids had a great time sliding, riding and picking pumpkins!! 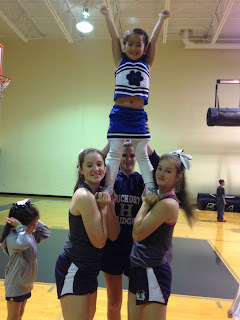 Recently, Lil' Miss had the opportunity to participate in our local high school's cheerleader camp. 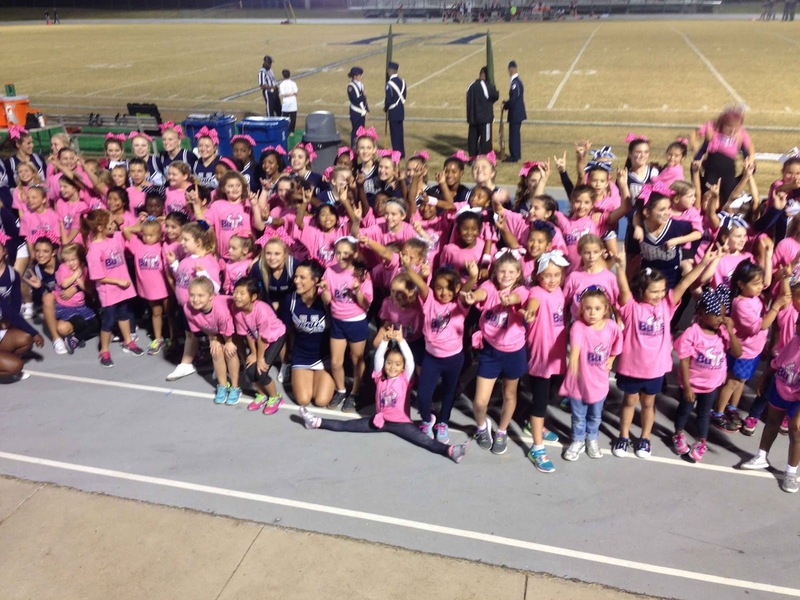 The one-day camp was open to elementary age girls and was led by some of the high school cheerleaders. 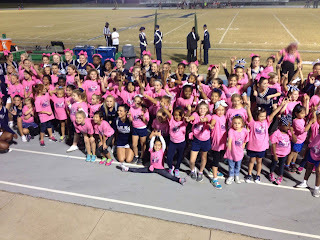 Then, the girls got to take part in one of the high school's Friday night football games. 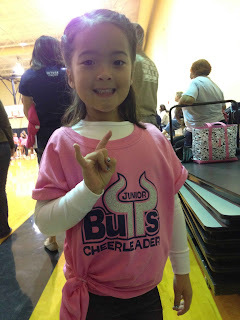 To say that Katy loved her foray into being a "cheerleader" would be an understatement....! I see lots of jumps, leaps and splits ahead! 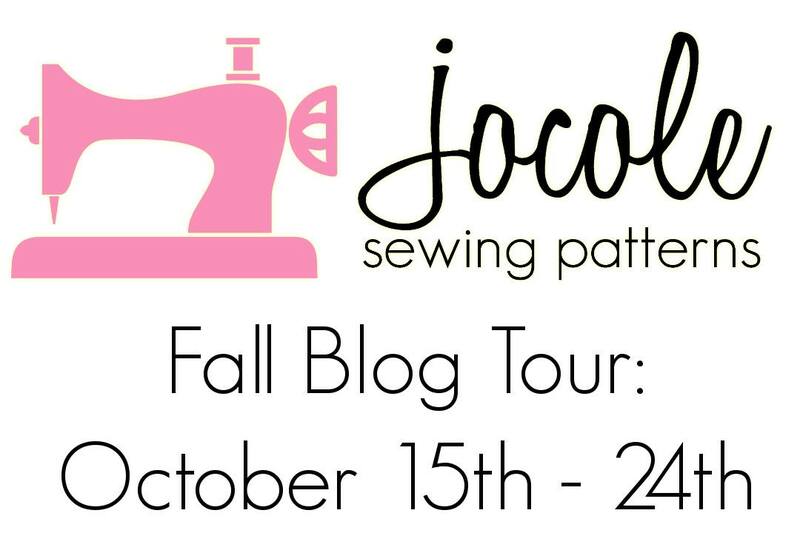 Today, is my turn on the Jocole October Blog tour. 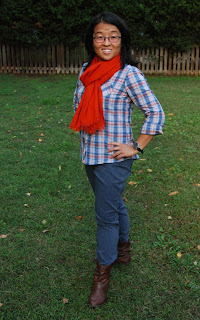 I'm excited to share some Jocole love with you- Mama Style! While Jocole has many lovely patterns- for both girls AND ladies- I decided to do some self-care sewing and sew some things for ME! 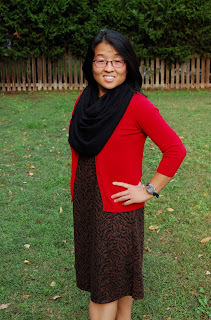 The focus of this blog tour was to highlight some Jocole PDF sewing patterns that would be great for layering, mixing and matching and getting ready for cooler months. First up, the Jocole Ladies A-Line Shift Dress and Top! The Jocole Ladies A-Line Shift Dress and Top is a simple, sleeveless dress that can be dressed up, or dressed down. This is the perfect wardrobe staple as it can be layered and accessorized to be worn year-round. -The Jocole Ladies A-Line Shift Dress and Top is sized for XS-XXXL. 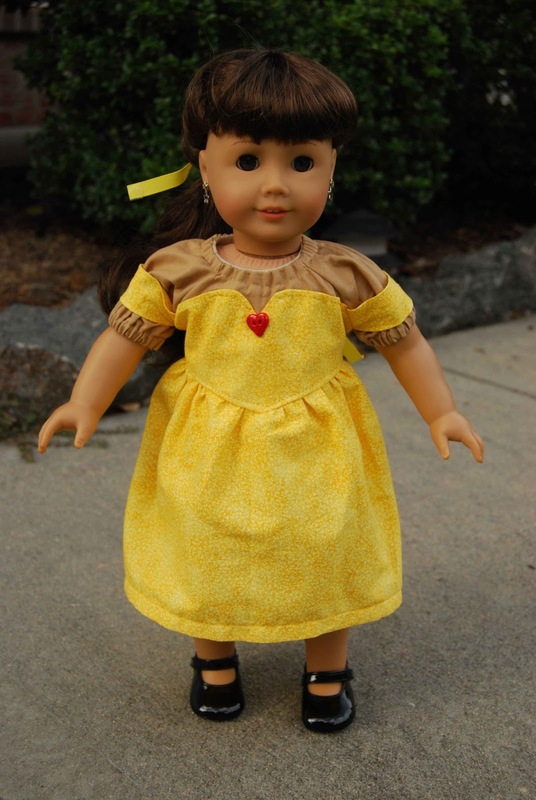 -The Jocole Ladies A-Line Shift Dress and Top PDF sewing pattern includes a fabric yardage chart, a sizing chart, a cutting chart, a pattern layout chart, a glossary of terms and tips and tricks to getting the best fit. -The Jocole Ladies A-Line Shift Dress and Top has two neckline options- scoop or boatneck. -The Jocole Ladies A-Line Shift Dress and Top has three hem lengths- tunic, knee and below knee. -The Jocole Ladies A-Line Shift Dress and Top tutorial features shaded illustrations and numbered steps throughout. -The Jocole Ladies A-Line Shift Dress and Top is written for wovens and does feature a back zipper. The pattern does say that lightweight knits can be used, as well. After consulting the sizing chart, I sewed up a size small chest/hips graded out to a medium at the waist. I always have a hard time sewing for myself because I don't fit just one size when it comes to my measurements! I did the boat neckline, knee-length dress option. I modified the pattern slightly by using a heavier weight ponte roma KNIT fabric (not terribly stretchy) found on the clearance table at my local Hancock fabrics. 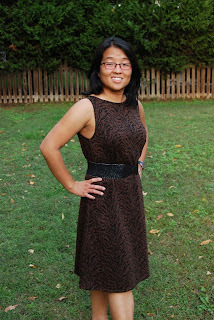 Because I used a knit, I did NOT have to use a zipper- the dress just slid over my head. (Yay! for no zippers!) In retrospect, I probably could have gotten away with doing a straight small (and not grading out to a medium in the waist) due to the use of knit fabric, Next time, next time....! I love the way the Jocole Ladies A-Line Shift Dress and Top neckline s finished! It is finished using bias binding for a clean, finished neckline- so professional (If I do say so, myself! ;-)!! The boat neckline is not at all revealing and the Jocole Ladies A-Line Shift Dress and Top would meet even the strictest dress code! This is the first outfit that I've sewn that used darts at the bust. Darts help to give an otherwise shapeless dress some form. 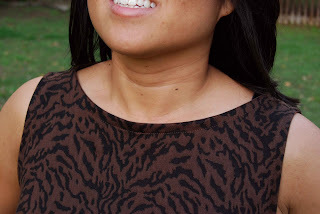 The directions in the Jocole Ladies A-Line Shift Dress and Top tutorial really make it easy- trust me- you can do it! Even with learning a new skill (darts), I was able to easily sew up the Jocole Ladies A-Line Shift Dress and Top in minimal time. I ended up having to fiddle with the openings at the arm. Because I'm shorter than the average 5'-5" woman that the pattern is written for, the arm holes were gaping when I first sewed up the Jocole Ladies A-Line Shift Dress and Top. However, it was an easy fix- just bring the underarm in a bit and- ta-da- fixed! The Jocole Ladies A-Line Shift Dress and Top is perfect for wearing as-is, accessorized, or even layered with a scarf and cardi. I LOVE the way my Jocole Ladies A-Line Shift Dress turned out and I can't wait to wear it to work! Next up is the Jocole Ladies Skinny Pants, Capris and Shorts. The Jocole Ladies Skinny Pants, Capris and Shorts are a skinny pants pattern with the ease and comfort of a comfy knit waistband. I'm a short girl and it's really tough to find pants that fit me correctly. I love the idea of making my own pants, to fit me, at just the right length! -The Jocole Ladies Skinny Pants, Capris and Shorts is sized for 00-28W. 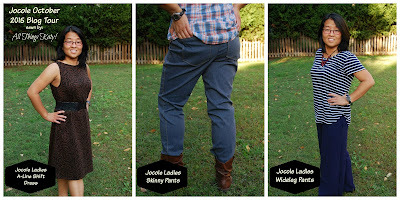 -The Jocole Ladies Skinny Pants, Capris and Shorts PDF sewing pattern includes a fabric yardage chart, a sizing chart, a cutting chart, a pattern layout chart, a glossary of terms and tips and tricks to getting the best fit. -The Jocole Ladies Skinny Pants, Capris and Shorts has seven length options- shorts, bermuda, clam digger, capris, ankle petite, regular and tall. -The Jocole Ladies Skinny Pants, Capris and Shorts has three waistband options- skinny, regular or fold-over waistband. -The Jocole Ladies Skinny Pants, Capris and Shorts includes pattern pieces/directions for optional front patch pockets and back pockets. -The Jocole Ladies Skinny Pants, Capris and Shorts tutorial features shaded illustrations and numbered steps throughout. For my first attempt (also called a "muslin") at the Jocole Ladies Skinny Pants, Capris and Shorts, I sewed a size six leg and hips graded out to an 8 for the waist, petite full length pants. I used a regular denim with no stretch found in my personal fabric stash. The pants came together quickly and easily! The pattern is super easy to follow. -I added 1/2" to the width of the front leg pattern piece. I added this width only to the bottom part of the pants leg (ie, where my calves hit). -I added 1/4" width to the front of the pattern piece where the hips hit. -Instead of cutting at the "petite" length, I added 1" to the overall length- not quite regular, not quite petite but JUST right for me! 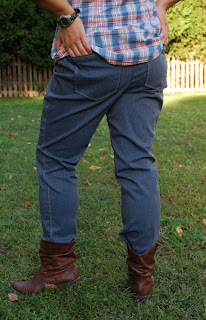 -Next time (I did not do this for the pictured pair), I would also lower the back rise of the pants. For the Jocole Ladies Skinny Pants, Capris and Shorts that you see pictured, above, I used a stretch denim purchased locally off the clearance table at Hancock Fabrics. Boy, did that stretch make a world of difference!! 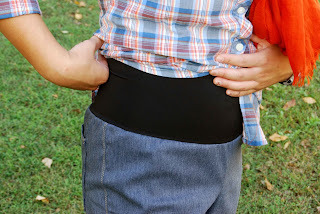 I used super stretchy ITY black knit for the regular waistband and I included back pockets. I took the time to do some contrast top stitching along the length of the leg and the back pockets to make my Jocole Ladies Skinny Pants, Capris and Shorts look more "professional." I'm so glad that I did! Sewing the Jocole Ladies Skinny Pants, Capris and Shorts was such a good lesson in learning to fit and sew for my body shape. I'm not typically a "skinny pants" kind of gal, but I love the way they look under an over-sized sweater, or layered with a cozy scarf for cooler months. The Jocole Ladies Skinny Pants, Capris and Shorts are definitely a great way for any woman, of any size, to sew up a pair of their very own, best-fitting skinny pants! 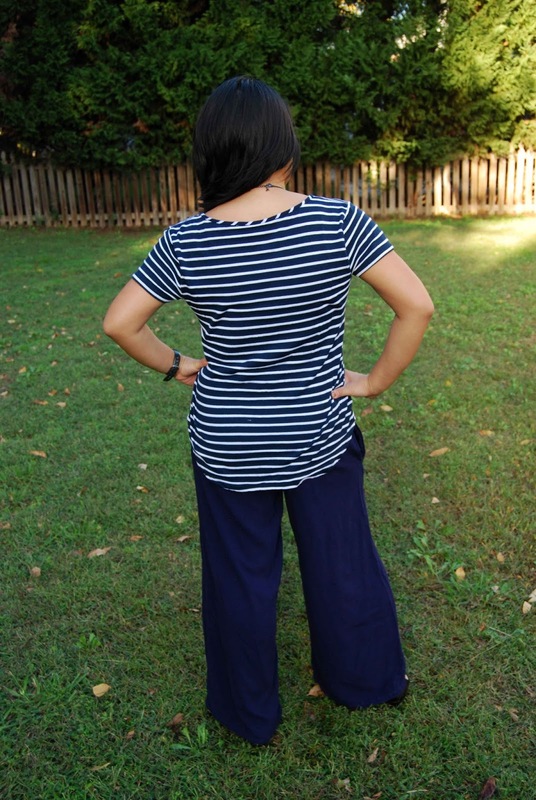 Last, but not least, I sewed up the Jocole Ladies Wideleg Pants, Capris and Shorts. The Jocole Ladies Wideleg Pants, Capris and Shorts are a wideleg pants pattern with a comfy knit waistband. -The Jocole Ladies Wideleg Pants, Capris and Shorts are sized for XS- XXXL. -The Jocole Ladies Wideleg Pants, Capris and Shorts feature five lengths- short, capri, petite full, regular or tall. 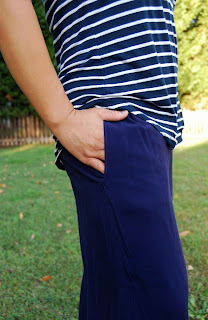 -The Jocole Ladies Wideleg Pants, Capris and Shorts PDF sewing pattern includes a fabric yardage chart, a sizing chart, a cutting chart, a pattern layout chart, a glossary of terms and tips and tricks to getting the best fit. -The Jocole Ladies Wideleg Pants, Capris and Shorts has three waistband options- skinny, regular or fold-over waistband. -The Jocole Ladies Wideleg Pants, Capris and Shorts includes pattern pieces for optional inseam pockets, patch pockets and optional extra wideleg. -The Jocole Ladies Wideleg Pants, Capris and Shorts tutorial features shaded illustrations and numbered steps throughout. I sewed up a size medium, petite regular, regular waistband Jocole Ladies Wideleg Pants, Capris and Shorts with inseam pockets. I purchased the drapey poly-rayon fabric at my local Hancock Fabrics (can you tell that I'm a regular there?! ;-). I love the easy dressing and drapiness of the Jocole Ladies Wideleg Pants, Capris and Shorts. 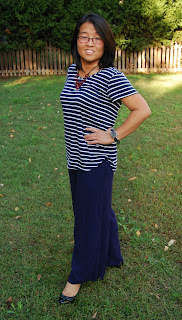 These pants make it easy to get ready in the morning AND they are super comfy!! Seriously! The pants were a snap to sew up. My only issue with them is the fact that they wrinkle easily (fabric choice). The Jocole Ladies Wideleg Pants, Capris and Shorts are another great, all-year round pattern. Shorts for the summer, pants for the winter. With the voluminous look and feel of the pants, the Jocole Ladies Wideleg Pants, Capris and Shorts would look good layered with a more fitted sweater, comfy scarf, or chunky necklace. I just love a versatile pattern! So (or, should I say, "sew" ;-), there you have it- some beautiful wardrobe staples all thanks to some Jocole PDF sewing patterns! I learned some new techniques along the way, all while helping build my fall/winter wardrobe. Sew.Much.FUN! Thank you, Jocole, Jodi and Kara, for allowing me to partake in this fun blog tour! Did you hear....? That Disney's movie, Aladdin, was re-released to blu-ray and digital copy from the vault, recently? Well, with the re-release of Aladdin, Genie and Jasmine, one of my favorite PDF sewing pattern designers, Made for Mermaids, released their own pattern for "Jasmine." 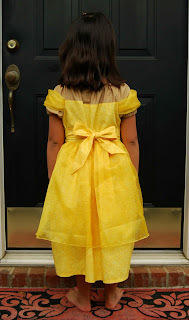 However, I took my own spin on the pattern and used the "Jasmine" pattern to create the perfect "Belle" (from Beauty and the Beast) for Lil' Miss. -The Made for Mermaids Jasmine comes in sizes 1/2-8. -The Made for Mermaids Jasmine features a sweetheart neckline, hip veil and arm sashes all with the simplicity and ease of a (fitted) peasant dress. -The Made for Mermaids Jasmine PDF sewing pattern features trimless, layered pattern pieces (ie, only print the size that you need/want and no need to pre-trim the pattern pieces- just match and go! LOVE THAT!!!!). 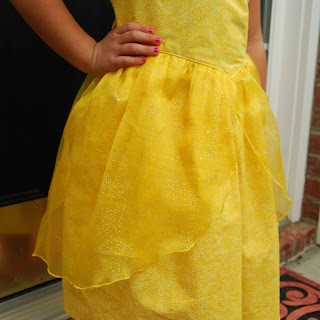 -The Made for Mermaids Jasmine tutorial includes a sizing chart, fabric requirement chart, cutting chart and tips and tricks along the way to guide you to the perfect dress. -The Made for Mermaids Jasmine has two bottoms option- pants or dress. -The Made for Mermaids Jasmine has two bodice options- cropped or full coverage. -The Made for Mermaids Jasmine tutorial features numbered step-by-step instructions with corresponding photographs. 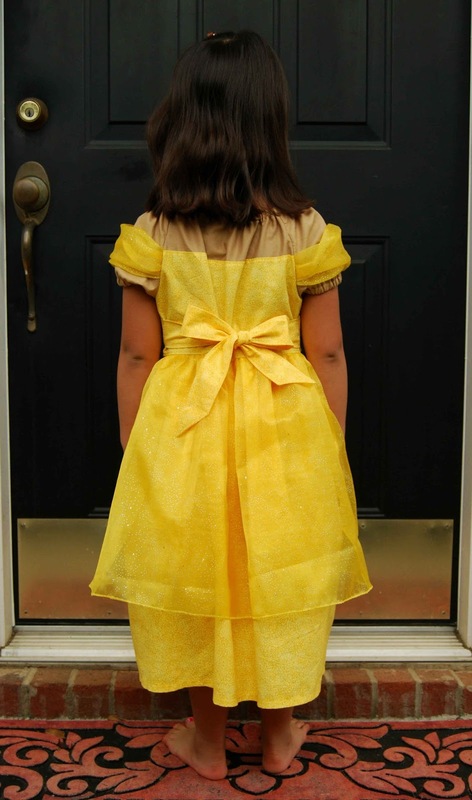 I sewed up a size six, full coverage, hip veil, optional sashes Jasmine (as Belle) dress with arm sashes. I used simple cotton woven from Wal-Mart for the bodice, "skin" and skirt. I used a sheer material with little sparkles (also purchased at Wal-Mart) for the hip veil. Red rose button was purchase locally from Hobby Lobby. 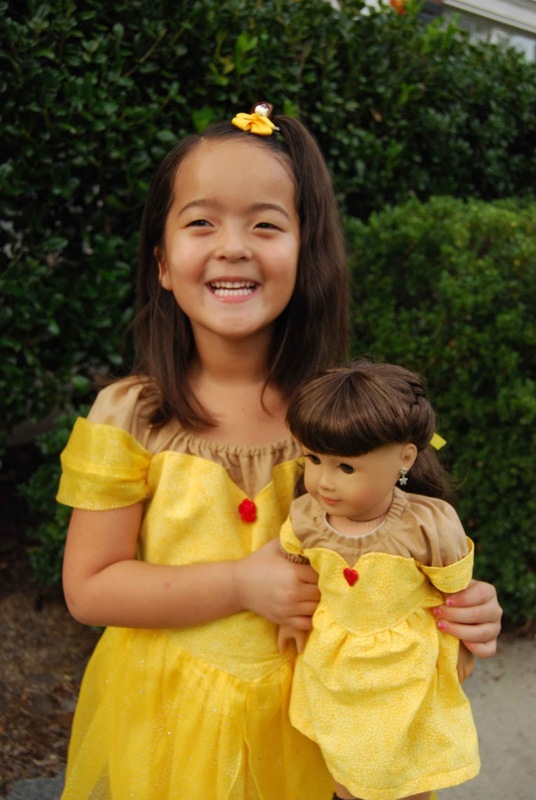 This dress sewed up easily and the instructions were simple to follow. The photographs really helped me understand what I was sewing and what step to take next. I won't lie, though- the Made for Mermaids Jasmine is not necessarily what I would consider a "quick" sew. There's a lot of fabric/layers involved and it takes time and precision to make sure everything lines up, lays smoothly and matches. 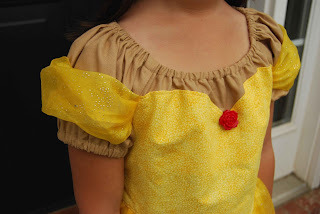 With the full coverage bodice, there is a bit of "pattern mashing" that also needs to occur. 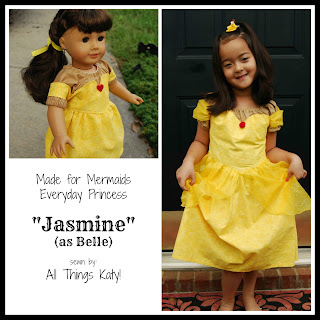 I would consider the Made for Mermaids Jasmine more of an "adventurous beginner" level PDF sewing pattern. The arm sashes can be a bit tricky, but it's totally doable and, trust me, you will LOVE the end results!! I love that the Made for Mermaids Jasmine pattern has the "illusion" of a bare midriff without actually having a bare midriff. By mixing "skin" colored solids with patterned/colored fabrics, the Made for Mermaids Jasmine helps you create that princess Jasmine look while helping to keep our little girls modest. 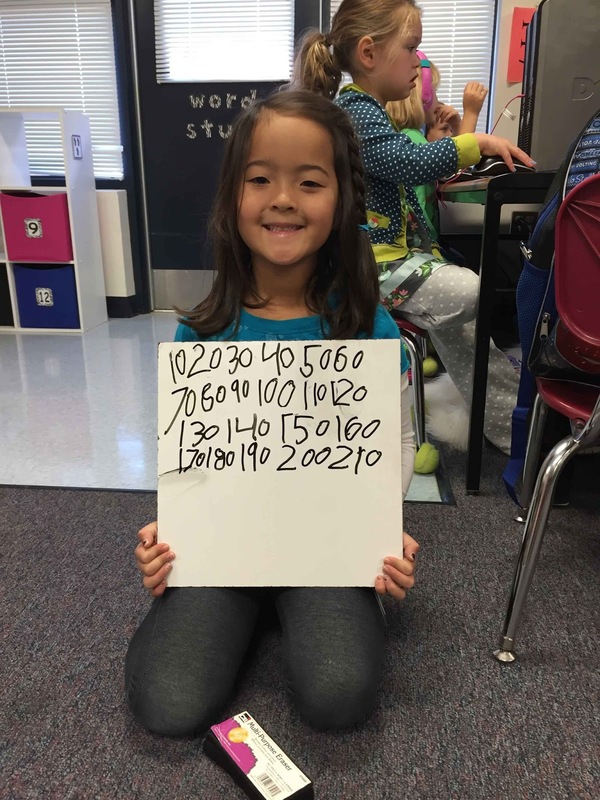 I love that and so appreciate that in a little girl's pattern! Speaking of "skin" colored solids- in my experience in sewing up the Made for Mermaids Jasmine, I found that you may want to cut two bodice overlays (opposed to the one bodice overlay and one cropped bodice lining, as instructed in the tutorial) for maximum opaqueness. Lil' Miss LOVES her new Jasmine (as Belle) dress!! 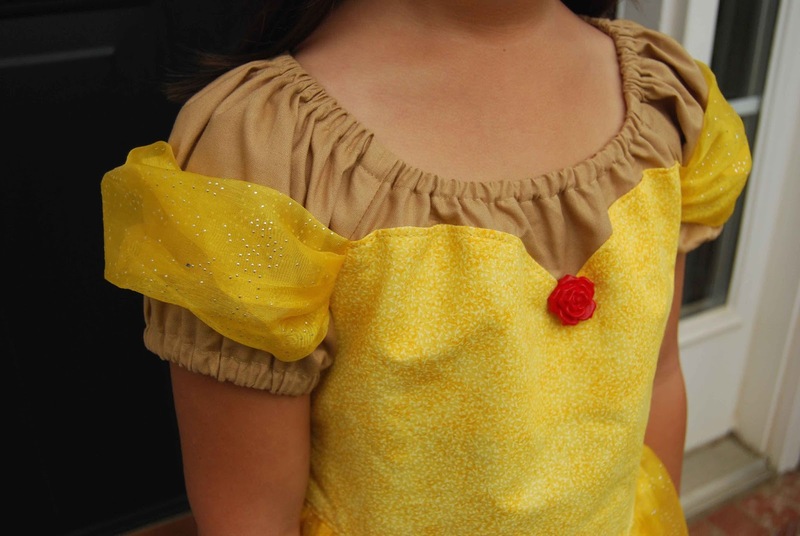 She's been begging me for a mama-made Belle Dress for quite some time, now. She told me that she felt quite, "sophisticated" with the arm sashes and she loves the sheer hip veil! 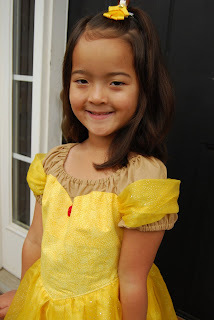 As soon as she put on the dress, she was running around and dancing in her new Jasmine (as Belle) dress. This morning, Katy was coloring in her reading chart (as she is supposed to do every day for Kindergarten). This month's object to color is a pumpkin (you know- October and pumpkins just seem to go together!). 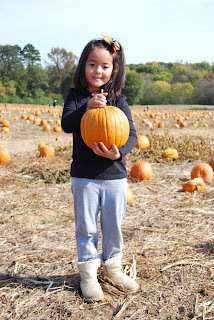 She was "accessorizing" her plain ol' pumpkin(a MUST for our Fancy Nancy!) and giving it a face and hair. Ted asked her if she was giving her pumpkin a "toupee." This promptly started a discussion about toupees and wigs. Then, as Katy was finishing up her pumpkin/toupee masterpiece, she declared, "Toupee is my most favorite word, EVER!!" Hahahahha- that girl! I love that she loves words and isn't afraid to ask for a definition and use it (properly) in a sentence.